The history of the world wide web goes back quite a ways and has been documented countless times, each take slightly varied from the last. It may even go back longer than you may think. An interesting timeline has been spotted that collates important points in web history dating back to 1910. The timeline is designed with a smooth, streamlined user interface that highlights important dates, technologies, browsers, various milestones and key individuals throughout the history of the world wide web. It was created by John Allsopp the co-founder of technology conference company, Web Directions. While it's certainly not the most extensive historical archive, you'll likely learn a few new interesting bits of information in here. The first entry on the timeline dates back to 1910 when the Mudaneum was founded by Paul Otlet and Henri La Fontaine. It was an institution that aimed to create a massive global information network based on a system the group developed called the Universal Decimal Classification. Otlet would later go on to outline a concept of globally connected information networks in 1934. The timeline continues with the first concept of hypertext in a 1945 publication of The Atlantic Monthly, then moving all the way up through to the present day. Another notable moment, although probably more well-known, was the original web browser. Developed by Tim Berners-Lee on a NeXT computer, the browser was originally called WorldWideWeb and was later renamed Nexus. At the time it was the only way to view the web along with being the first web editor as well. 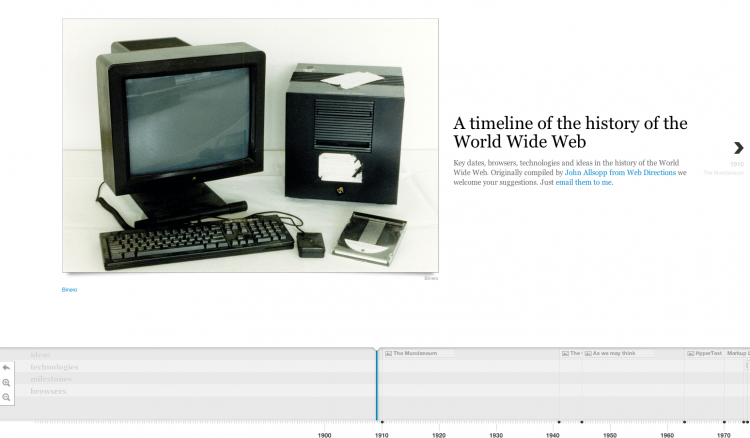 Be sure to check out Allsopp's history of the web timeline for yourself.